Four-time National Scottish Harp Champion Sue Richards and multi-instrumentalist Robin Bullock have been friends and colleagues for decades and were longtime stalwarts of the Baltimore-Washington area Celtic music scene, where they both won WAMMIE Awards from the Washington Area Music Association for solo albums on the Maryland-based Maggie’s Music label. 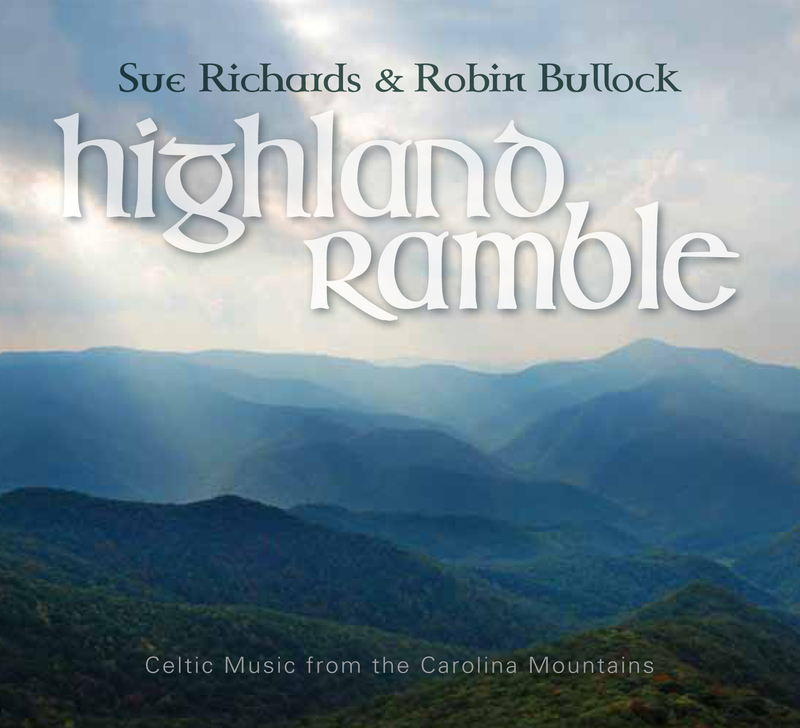 Now both transplants to the western North Carolina mountains outside Asheville, Sue and Robin celebrate their mountain home and its rich heritage of Scottish and Irish tradition with their duo debut, Highland Ramble: Celtic Music from the Carolina Mountains. A long-overdue chamber-Celtic collaboration between two masters, Highland Ramble blends the ancient and magical tones of the Celtic harp with the powerful resonance of the steel-string guitar, cittern, and mandolin, drawing on Scottish, Irish, Swedish and American traditions to create something truly unique: beautiful and timeless, yet fresh and alive. A set of traditional Scottish pipe tunes to start off. Sue admits to liking the maiden and crone theme. A pair of original waltzes: Robin wrote the first in honor of luthier extraordinaire Stefan Sobell and his wife Liz, and Sue wrote the second for a friend’s wedding. Composed by one of our all-time favorites, the legendary blind Irish harper Turlough O’Carolan (1670-1738). Dr. John Hart was a Catholic bishop noted for his kindness and hospitality; legend has it that all the birds in his home region assembled at his funeral and sang his requiem. Maybe this is the tune they sang. Three recent tunes in the Scottish tradition composed by non-Scots. Robin wrote the first, taking the inspiration for the title from a full-size, two-story castle constructed of solid ice every winter on the shore of Saranac Lake in upstate New York. Sue wrote the second during a stay in Scotland when she and some friends were suddenly drenched by a short squall while visiting Castle Lachlan ruins. Our friend John Knowles wrote the third and named it for the boatman’s cottage in Ardentinney, Argyll, Scotland, along the banks of Loch Long, where he met his wife (and Sue’s harp compadre) Sharon. Tunes by Carolan for three ladies of his acquaintance. Their various personalities come through in the music. The first tune, also known as Miss Admiral Gordon’s Strathspey, is commonly set to Robert Burns’s lyric: “O’ a’ the airts the wind can blaw, I dearly like the west / For there the bonnie lassie lives, the lassie I lo’e best.” The second tune was written by fiddler Ryan MacKasson for his friend and fellow fiddler Hanneke Cassel Block (both bandmates of Sue’s in Ensemble Galilei) when they were still teenagers fantasizing about weddings. Fiddler Jay Ungar’s lament for the end of the summer season at Ashokan Music and Dance Camp in upstate New York became known to millions when Ken Burns used it as the main theme for the PBS miniseries The Civil War. We like the way it sounds on cittern and harp too! A wedding polska from Älvdalen, Dalarna, Sweden, dating back to at least the mid-19th century. “Farmor” is the grandmother on the father’s side (literally, “father’s mother”). Sue learned this one from Beth Kolle on a sunny morning in Norway. A pair of hornpipes whose titles show a fairly obvious thematic connection. The first was composed by Jim Cowdery, a member of a 1970s American Irish band with the wonderful name How To Change A Flat Tire, and the second as far as we know is traditional Irish. Robin learned this French waltz from an accordion-playing trapeze artist in Paris during his years living in France. Neither she nor anyone else in her circus company could provide any information about the tune, so until such time as we learn more we just call it by this title (“The Trapeze Artist’s Waltz”). One more great harp tune from Carolan. The music describes quite a dandy. We wonder if his buddies call him Lofty. Another Swedish polska, this one from the village of Hälleforsnäs, Södermanland County, Sweden. We finish with a set of jigs known and loved by Irish musicians everywhere. In Sue’s mind there’s an adventure hinted at in those titles….